A Slurpee and a used copy of Prototype? It's more likely than you think. 7-Eleven is teaming up with Game Trading Technologies, Inc. to offer a wide selection of "Great Games Below $20" at franchise locations throughout the U.S. Already known for its creative interpretation of the term 'street date' in regards to new video games, 7-Eleven will soon be offering used video games at more than 3,000 stores across the country. 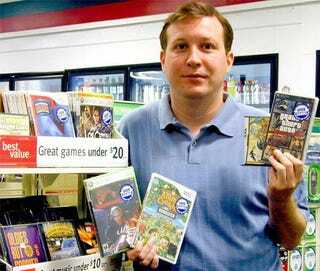 A partnership with pre-owned video game supply and service company Game Trading Technologies will see the debut used game bins branded as "Great Games Under $20," filled with used titles for popular platforms. 7-Eleven Street Date Breaking Party Pooped? "We partnered with GTT because of their experience and expertise as a third-party provider of video games and the terrific selection they'll offer to our customers," said Michael Jester, 7-Eleven category manager for gaming and electronics. "More than 60 percent of U.S. households now have at least one video game console, and consumers are searching for convenient ways to stretch their entertainment dollar in this challenging economy." Game Trading Technologies hopes to have the program running at most U.S. stores by September of this year.